Adraki Rathaloo is a simple mildly flavoured stir fry that is super easy to put together and goes very well with steamed rice, curd rice or even Rasam-Rice. Once a fortnight, we have sweet potato in Tikki / Patties form , use it as a filling for Baked Samosas or even make a quick oil free Rathaloo Chaat. Compared to the potato, this tuber is known to be beneficial for diabetics too with its low glycemic Index. Addition of onions is totally optional and I havent added the same. The mild flavour of ginger in this stir fry is a wonderful discovery I made this noon as we had this with Poricha Rasam, steamed rice for Sunday Lunch. Sending this to Blogging Marathon # 15 under "Accompaniments" theme as a day 7 entry. In case you have missed any of the last 6 days under this theme, here is a quick recap. Now, over to the dish today. 1) Wash and scrub the vegetable. Cube it with the skin on. 2) In a pan, add oil. Splutter mustard seeds, curry leaves, urad dal and asafoetida. Once the dal turns slightly brown, add the grated ginger or juilennes of ginger. Saute lightly. 3) Add the cubed sweet potato, salt, turmeric and mix lightly. 4) Sprinkle 4 TBSP of water and cook covered on very low-medium heat for 8 - 10 mins. 5) Once the veggies are cooked, add the red chilli powder and saute once more with lid on for 2 more mins. 6) Serve hot with steamed rice or even lemon rice etc. 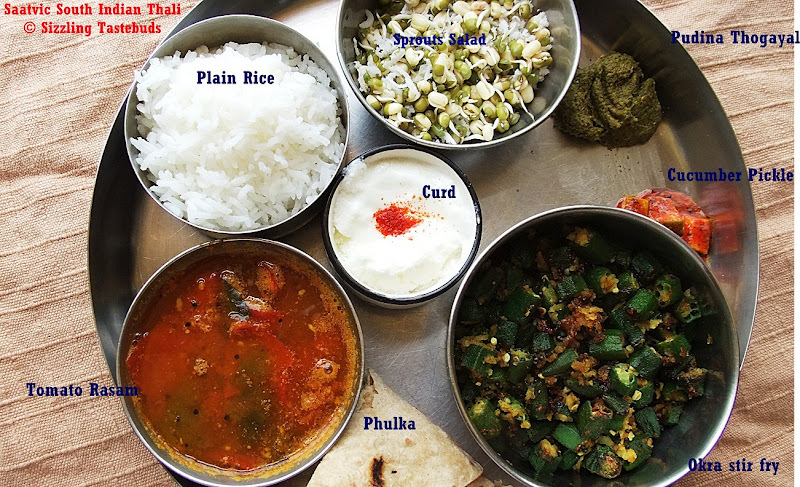 Ok, before I manage to fully put you to sleep with these trivia, I present today's dish, nee a pure Saatvic South Indian Thali (Thali in Hindi means platter). It is everyday dishes out together without any ginger / garlic/ onions and is also prepared with just 1 tsp of oil !! Yes, just 1 tsp of oil is used for the entire thali, and I must admit this was one of the most satisfying meals I have had in a longggg time :) Thanks to Valli's Thali Mela (to which this also goes to), I managed to cook an entire meal for myself (for lunch - something that I rustle up rarely as its cooking for only one person :)), and loved it. 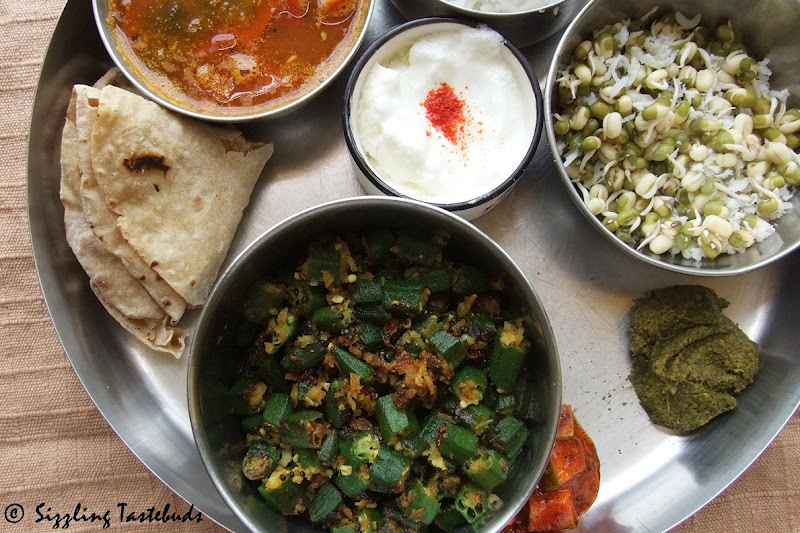 Also sending the Okra Stir fry (which was actually the star of this dish, and my personal personal favourite stir fry) to Blogging Marathon and my event Heirloom Recipes hosted by Saras. 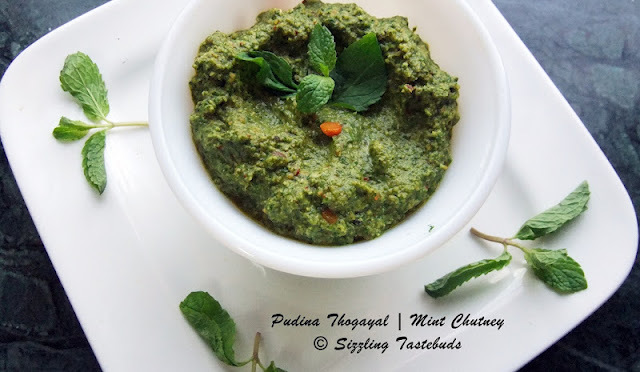 Dips - Pudina Thogayal & Cucumber Pickle (recipe soon). Wash, pat dry and trim the Okra. Cut into 1/2 inch bits. In a pan, heat 1 tsp oil. Splutter mustard, curry leaves and asafoetida. Add turmeric and chopped okra. Saute for 2 mins. Add salt and cover and cook for 6-7 mins till done (but not mushy). 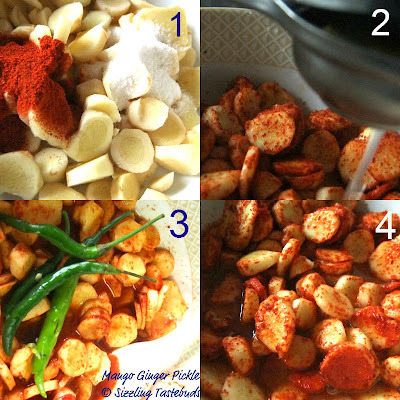 Add amchur powder, red chilli powder, jaggery. Stir once and cook for further 2 mins (without cover). Finish with grated coconut and serve with Rasam and Rice. 2) Grind the dal, mint leaves, grated coconut, tamarind with salt and jaggery to a thick paste adding very little water. Prepare tempering if you wish and add to the chutney and serve with hot steamed rice. 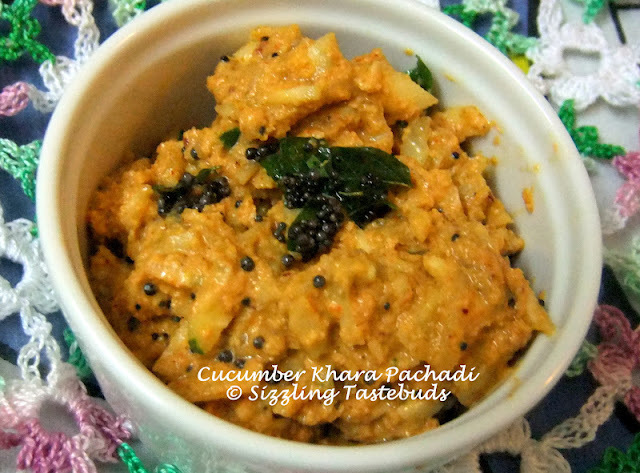 Vellarikai Khara Pachadi (Spicy Cucumber chutney) is another dish from my Paati's (maternal grandmom) stable. 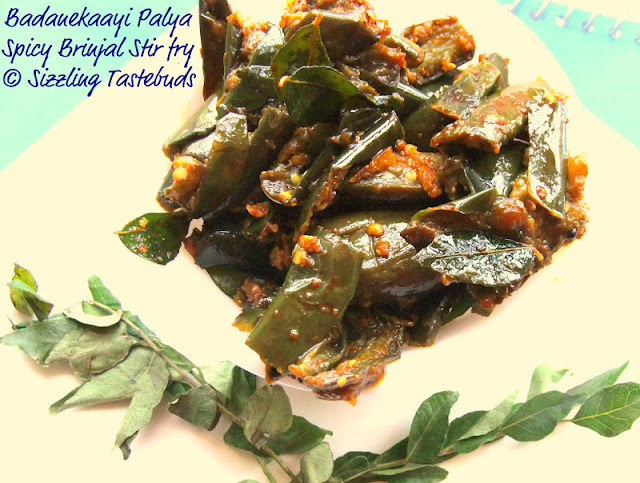 Spicy to the core, and relished with hot rice and ghee, this is one of the favourite accompaniments. And for some reason, I had totally forgotten this for quite some time, till a basketful of cucumbers landed in the refrigerator last week. Well I did make Koshimbir (Salads) and also Cucumber pickle (recipe soon! ), but then was lost for ideas, till mom reminded me on the phone. And boy, was I both ecstatic and impatient to make this. Amma gave me the recipe,and it came out well. 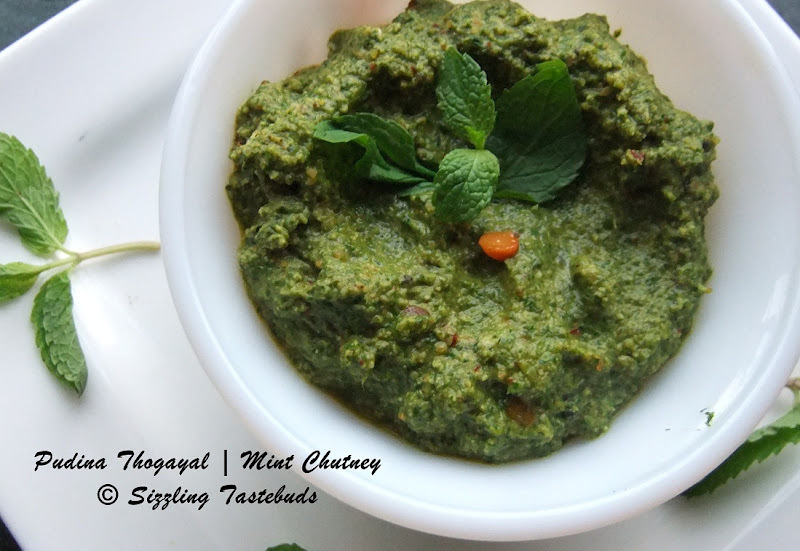 For the scorching summers, this is one yummy side dish that never fails whichever part of the year. And paired with yummy Curd rice, we had this for dinner. Even kiddo who is sceptical about new dishes (especially non baked ones) had this for a yummy filling meal. 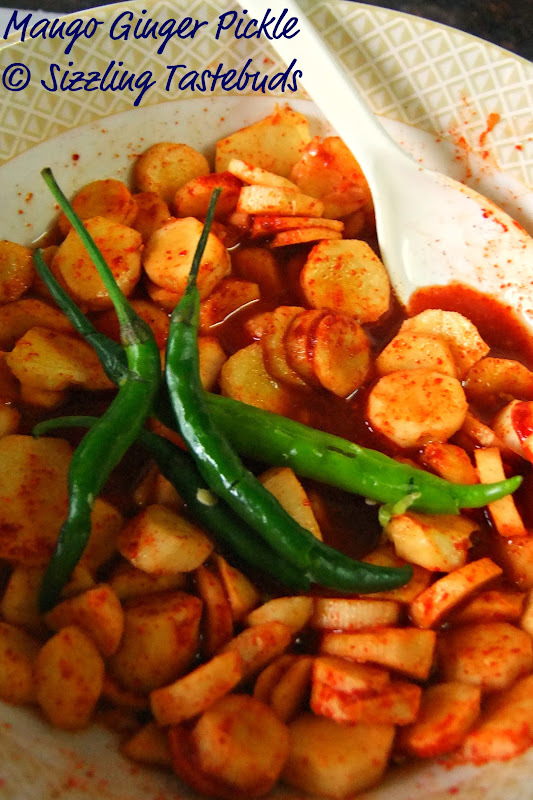 Traditionally, this dish is really spicy, so adjust the spice for your kitchen. Sending this to Blogging Marathon under"Accompaniments" theme and Vardhini's Healthy Side Dishes. Check out the other BMers here. Also sending this to my own event - Kitchen Chronicles Heirloom Recipes hosted by Saras & Gayathri's WTML hosted by Rasya. 1) In a large pan, heat 1 TBSP oil. 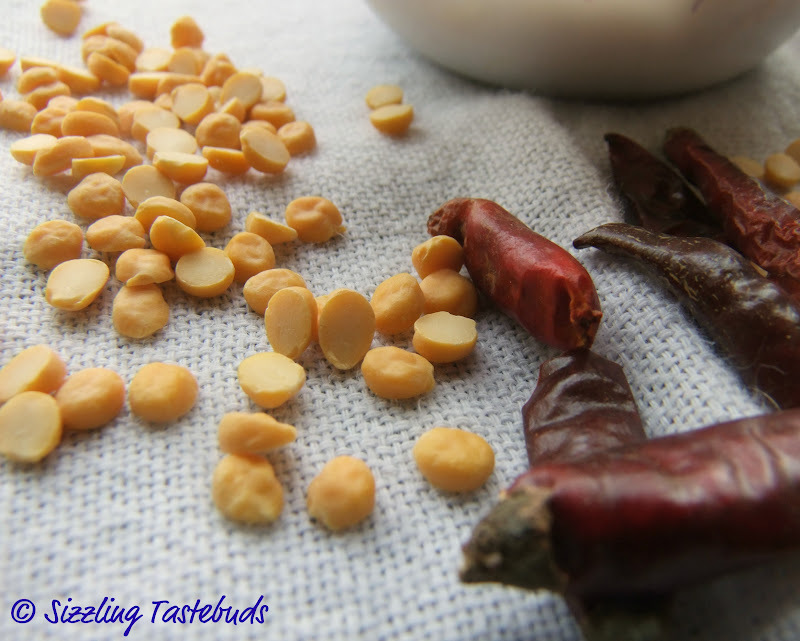 On medium heat, roast the channa dal, red chillies and green chillies. Set aside. In the remaining oil, fry the dry coriander seeds, cumin, tamarind. Turn off the heat and add to the roasted dals-chillies. Cool thoroughly. 2) Grind this mixture (without salt) but with coconut and asafoetida to a very thick paste. 3) Meanwhile, wash and peel cucumber. Dice into small tiny bits like you would do for Kosambari (Indian cucumber salad). Mix the paste into the cucumbers till the masala paste coats the vegetable well. Do not add salt at this stage too. 4) Prepare the tempering. 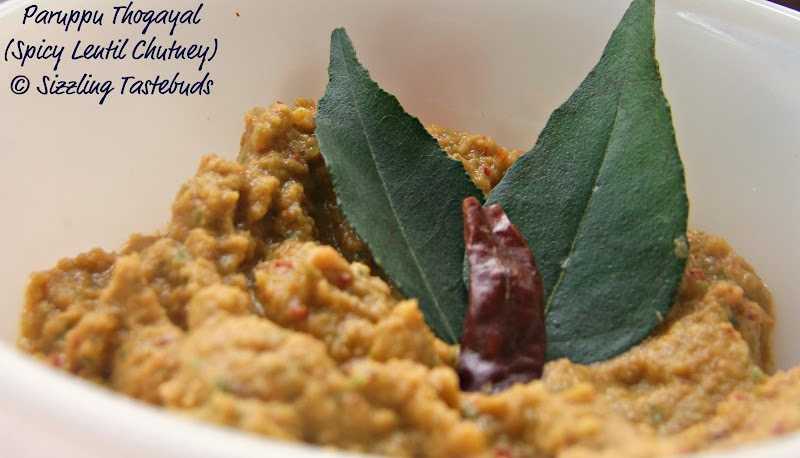 Once mustard splutters and curry leaves get slightly crisp, add to the chutney and mix well. Just before serving, add salt, mix well and serve immediately. 1) This dish tastes very well with very tender cucumbers. 2) If the cucumbers are not very tender, ensure to deseed the core, and then use the flesh only. 3) This dish does not keep well for more than a day, even with refreigeration. Use the pachadi immediately. 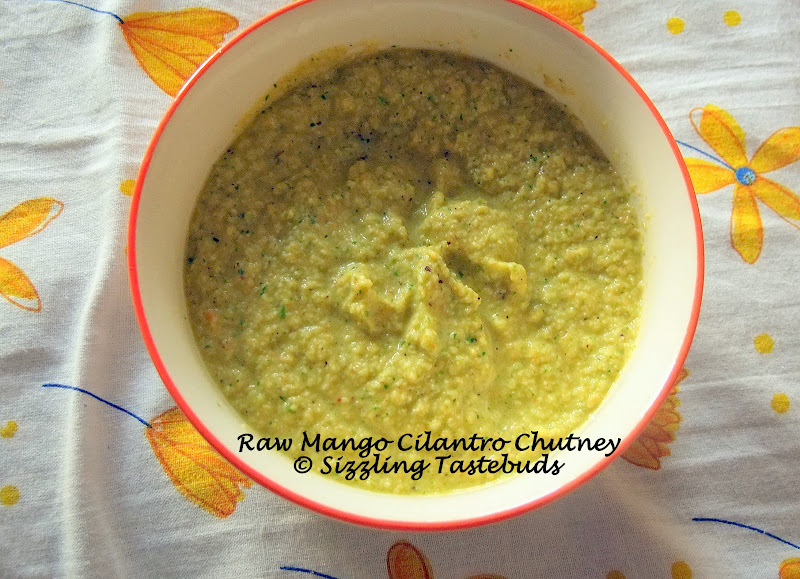 What tempted me in this recipe was the unusual combo - Raw mango and cilantro... During summer days, can it get any better than that - two of my favourite ingredients coming together in a yummy tangy chutney .. Although I generally make this Instant mango pickle with raw green mangoes, I was inspired by Suma's recipe that I had bookmarked here. So, attempted this combo and loved it to bits.. I am always on the lookout for fun filled ways of introducing greens and veggies, and this was a power packed one for breakfast. 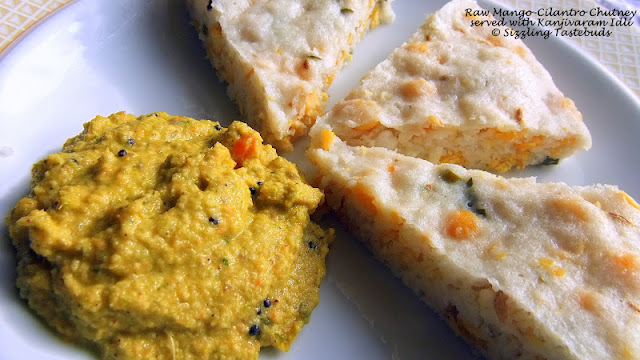 Served it with Kanjivaram Idli, it was a total sellout with S giving it a 5/5 rating and kiddo lapping up her button idlis (which she likes only with Molagapudi) :) Wonderful way to start the morning, wouldnt you say ? 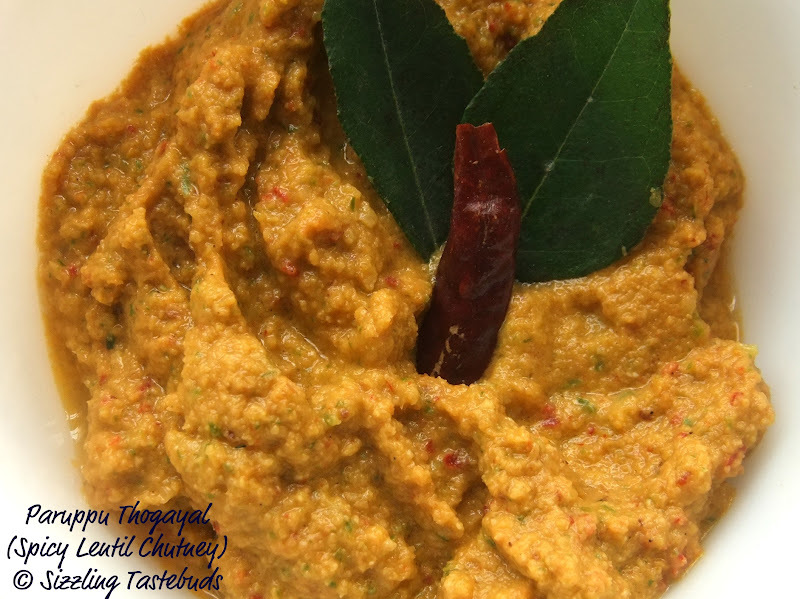 Thanks Suma for the recipe, which I modified a bit (sans peanuts and added carrots)... Am sure it would add to the growing list of yummy chutneys that my family loves so much. Now off to the recipe..
1) Wash and grate mango and carrots separately. 2) Wash and roughly chop coriander leaves. 3) In a pan, heat oil. Lightly saute the grated carrots, cilantro and grated mango for 1-2 mins till the cilantro wilts a bit and the raw smell of the carrots diminishes. Switch off the flame, and add the roasted gram and coconut and saute once more. 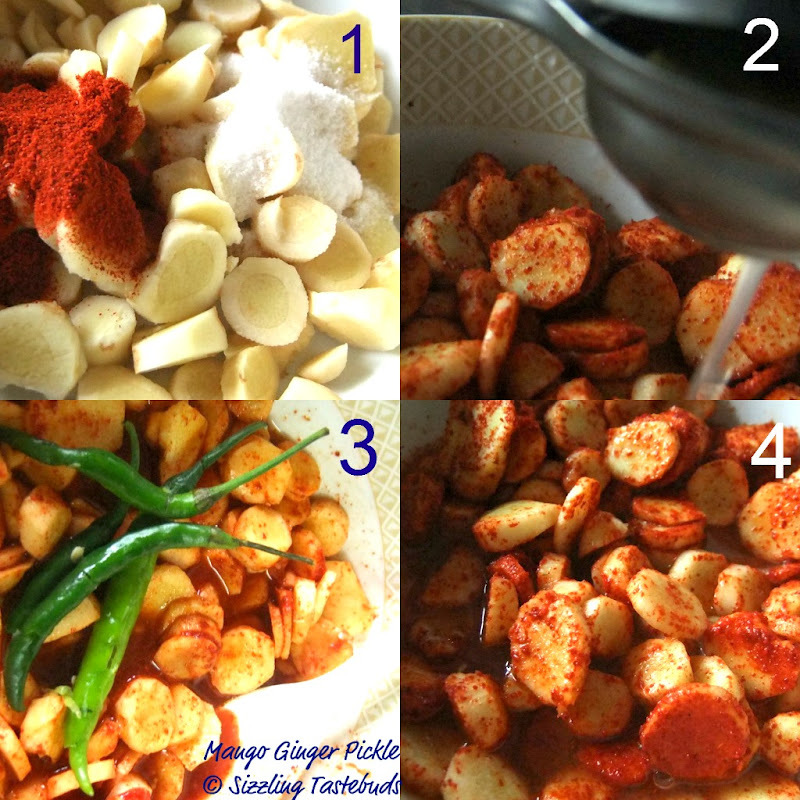 4) Cool the mixture thoroughly, and grind it to a smooth chutney with salt and jaggery. 5) Transfer to a serving bowl. Prepare tempering and add to the chutney. 6) Serve with Idli / Dosa or Uttapams. Badanekaayi Palya (quite a tongue twister there, huh?) 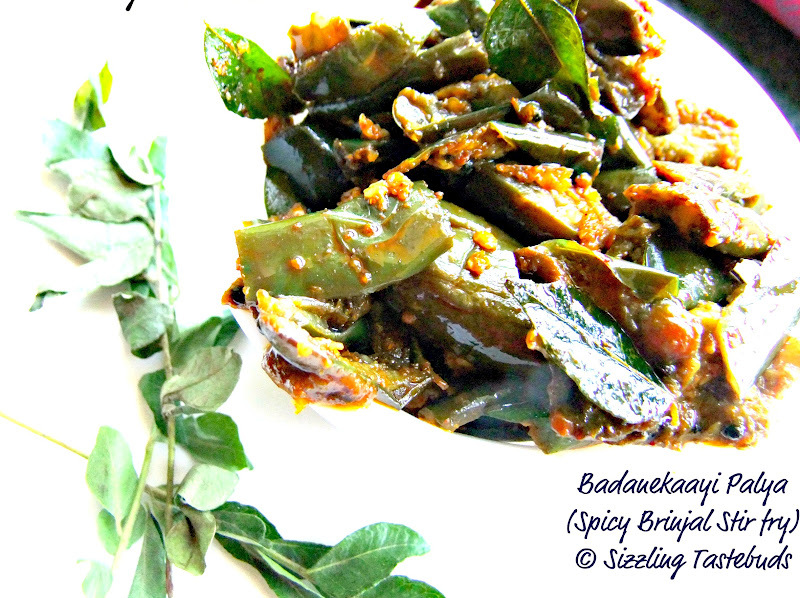 is a spicy brinjal based stir fry that has its origins in Karnataka. Thee is another version of this called Ennegayi (stuffed brinjal) which is eaten with Jolada rotti (Jowar flat bread) in most parts of Karnataka. Today's is the simplified version with less spice and oil (as that's how) my family loves it. For the ennegaayi, the round brinjals are usually stuffed with a masala paste and sauteed in oil but for the Palya (sabji) we prefer to make it with longish batons of chopped brinjal. I shall post the stuffed version soon . However for both dishes,the best quality dish can be had with the Mysore Badanekaayi (or the slender and tender green ones) although the purple variety is also preferred. Either way, make sure that the brinjals are slender and with very minimal seeds. Sending this to BM under "Accompaniments". Check the other marathoners here. Also to Vardhini's Healthy Side Dishes. In a pan, heat 1 tsp of oil. Fry the dry coriander seeds, dry red chillies and channa dal. Keep aside. In the same oil, turn off the flame and roast the rest of the ingredients for 1 min. Cool and grind the spice mixture. 1) Wash and trim brinjals. Cut them into 2 inch long batons. 2) Heat oil in a deep bottomed non stick pan. Splutter mustard, curry leaves and asafoetida. Add turmeric and the chopped brinjals. Add salt and saute till the oil coats them well. Sprinkle a very little quantity of water, cook and cover for 8-10 mins on medium flame. Do not add more than maybe 3-4 TBSP of water. 3) Once done (ensure the brinjals dont turn mashed up), add the tamarind extract, red chilli powder, jaggery and the ground spice powder. Stir once but dont over do it. Check for spice, cook with pan uncoverd for further 3-4 mins till the raw smell of the spice powder goes away. Each home in India has its own share of accompaniments - be it thogayals (thuvayals or chutneys), pickles, spicepowders - both for everyday meals as well as those made for occassions. I was recently reading a wonderfully chronicled book called "The Imperial Cholas" by the ITC Group (5 star hospitality chain) and there it mentions that these accompaniments were mostly made both to tickle the palate (with its blend of spices) as well as standins when vegetables were scarce. I think both the reasons are so true : How else can the simple Idli reach to greater heights with a wonderfully divine Molagapudi (fiery lentil spice powder) ? 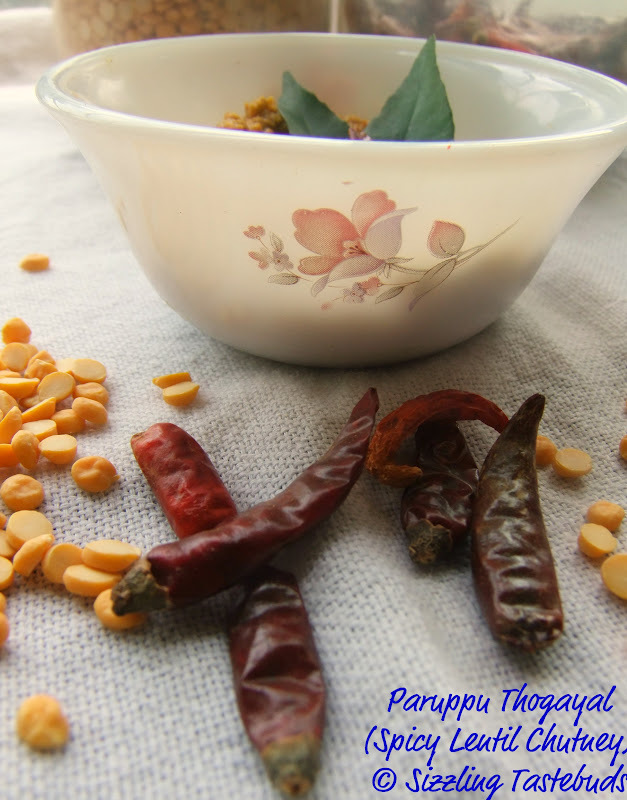 Or how many days have you (in a typical south indian home) craved for just Paruppu Thogayal with just roasted papad, steamed rice topped with a dollop of ghee or sesame oil with no other vegetables to complement the meal ? Well, dont dream anymore... coz this is a lipsmacking Paruppu Thogayal today. 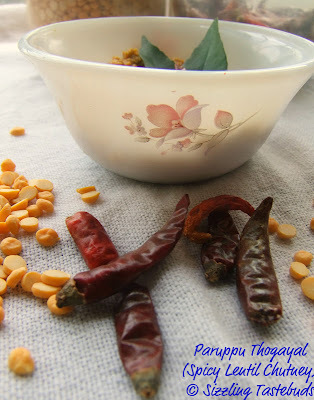 Team it with white rice for a fulfilling meal .Every Tamilian household has their own version of Paruppu Thogayal, but this is my grandmom's recipe, and am very proud to present this here for another week of Blogging Marathon under "Accompaniments" theme and Vardhini's Healthy Side Dishes. Check out the other BMers here. Also sending this to my own event - Kitchen Chronicles Heirloom Recipes hosted by Saras. In case you have similar recipes posted in the month of April, rush your entries to Saras here. 1) In a large pan, heat the Sesame oil. Roast the dals (lentils) on medium heat one by one till they turn golden brown and slightly crispy. Transfer to a plate. In the remaining oil, fry the tamarind, red chillies and transfer to the lentils plate. Cool completely. 2) In the hot pan (without any oil), roast the coconut once for 1 mins (with flame switched off). This is crucial to improve the shelf life of the chutney,especially in summers. 3) Now, DRY grind the dals, asafoetida, salt, jaggery to a very coarse powder (remember this is NOT a smooth chutney, but a rather coarse one, used to mix with the rice). 4) Now add tamarind and about 3 - 4 TBSP of water and grind to a thick kind of consistency. 5) Transfer to a serving bowl. 6) Heat 1 tsp of oil. Splutter mustard and curry leaves. Pour onto chutney and serve immediately.